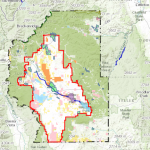 The Purpose of a Master Leasing Plan (MLP) is to provide Bureau of Land Management (BLM) managers a way to strategically plan for oil and gas leasing and development and address potential resource conflicts. MLPs were created to establish a guiding framework for the development of a given area and provide a vision for how future development will occur. Due to the large amount of data included in this map it may take a while to load. Please hit continue if asked. DataBasin – Online mapping tool that provides free and open access to thousands of scientifically-grounded, biological, physical, and socio-economic datasets.